To HCPs, it seems normal and necessary to intensely blame others. They can’t restrain themselves, even though their blaming may harm themselves as well. When problems and conflicts arise, instead of looking for solutions, HCPs look for someone to blame. They have an all-or-nothing approach. They think that it must be all your fault or else it might appear to be all their fault – and they can’t cope with that possibility for psychological reasons. They become preoccupied with blaming others in order to escape being blamed themselves. But you can’t point this out to them, because they become even more defensive. To HCPs, conflict often feels like a life or death struggle. This explains why it may feel like they are engaged in campaigns to destroy you or someone else. They feel that their survival is at stake, so that they often show unmanaged emotions and extreme behaviors – even in routine conflicts or under normal pressures. You don’t need to figure out whether someone is a high-conflict person. If you suspect someone is an HCP, just respond more carefully and understand that the person may have less self-control than you do. 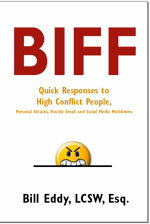 BIFF responses are a good method for coping with HCPs – and you can use them with anyone!